From pizza crust, to rice, to 'mashed potatoes', to now mac n' cheese, is there anything cauliflower can't make low carb? Whether you are looking at reducing your carb intake, or inspiration to include into your keto diet, cauliflower is probably the most versatile vegetable we've found to date. Cauliflower closely mimics the same consistency as macaroni and doesn't change the flavor of any dish you add it to. But compared to cooked pasta, which contains about 39g of carbs per serving, one cup of cauliflower packs only 3g of net carbs... and less than 30 calories! 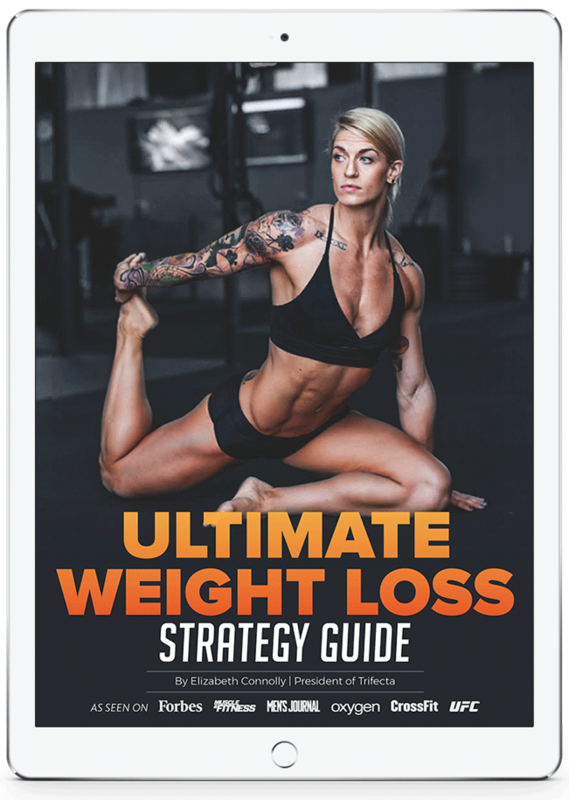 Making it a perfect addition to your keto diet or any low carb meal plan. A well executed mac and cheese can be one of the best sides to enjoy with just about any entree. Kids love it, and big kids - also referred to as adults - also love it every now and then. And making your own, even a keto version, is insanely easy. 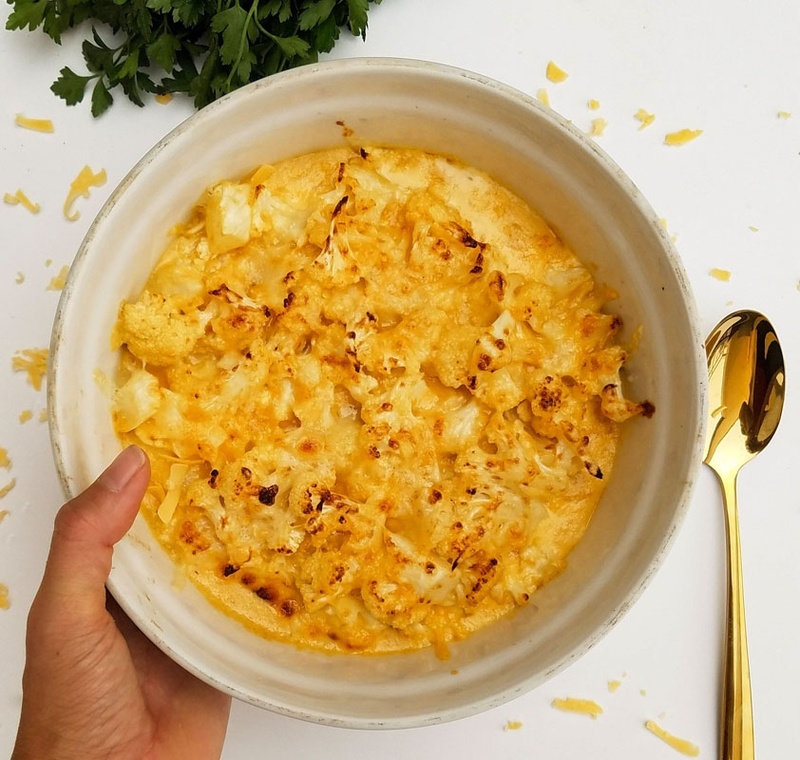 The secret to success in this recipe comes from roasting the cauliflower and combining different cheeses - helping to take a classic staple to a whole new level. Start by prepping your cauliflower. Look for a large head with no dark spots. Trim away the leaves and cut into small florets, enough to imitate the size of macaroni pasta. You can also include small pieces of stem. Add your cauliflower pieces to a large bowl and toss with garlic powder, salt, 2 Tsp. pepper, and a drizzle of oil. Don;t forget to save some pepper and garlic powder for the cheese mixture. Then toss gently to coat. I also love a little smoked paprika, cayenne or chili flakes for a kick. Place in a foil lined sheet tray and bake, for 12-15 minutes, until tender. Check constantly to avoid florets from burning. Remove once golden brown and cooked through. TIP: When roasting the cauliflower, high heat is your friend. Look for color in the cauliflower, as this caramelization yields massive amounts of flavor. My favorite way of seasoning vegetables in general is salt, pepper, and olive oil (not extra virgin) or grape seed oil. As your cauliflower roasts, you can crisp up your bacon. If your trying to keep this dish vegetarian, just skip this step. Cut bacon strips half lengthwise, and then width-wise to small rectangular strips. It might help to stack your bacon for cutting, and be sure to use a sharp knife. Put your bacon pieces in an unheated sauté pan, and bring the heat up from cold to medium - this allows the bacon to begin rendering and cook slowly. Let the pieces sit and don't stir until the bacon begins to crisp up. Once the bacon begins looking like crispy small teeth, stir with a wooden utensil, and remove from heat once fully crispy. Keep aside in a plate lined with paper towels to absorb the excess fat. Bonus flavor alert! Feel free to use some of the fat and stir it into the cheese sauce (this will add extra flavor). Now you can start prepping your cheese sauce. 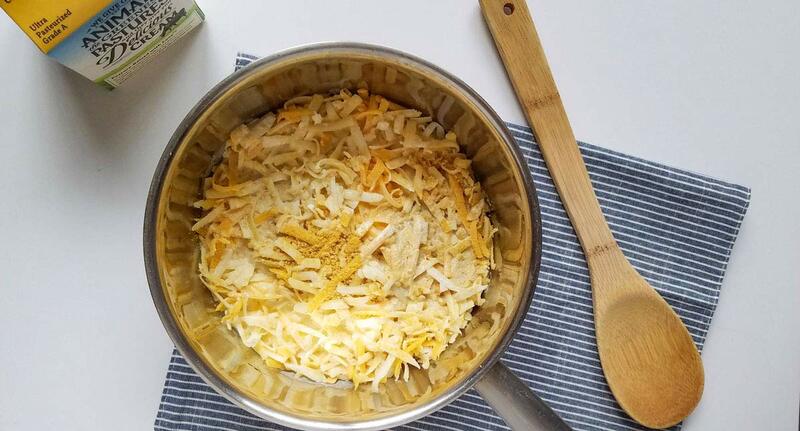 While it can be easier to just buy shredded cheese, it is worth taking the time to shred it yourself. Pre-shredded cheese often has added cellulose, potato starch, or other anti-caking additives, that prevent the cheese from sticking together in the package. Cellulose is completely safe and harmless, but it can effect how well your cheese melts. In other words, if you're looking for a silky smooth cheese sauce, stick with block cheese and shred it yourself. Feel free to combine your favorite cheeses as desired. 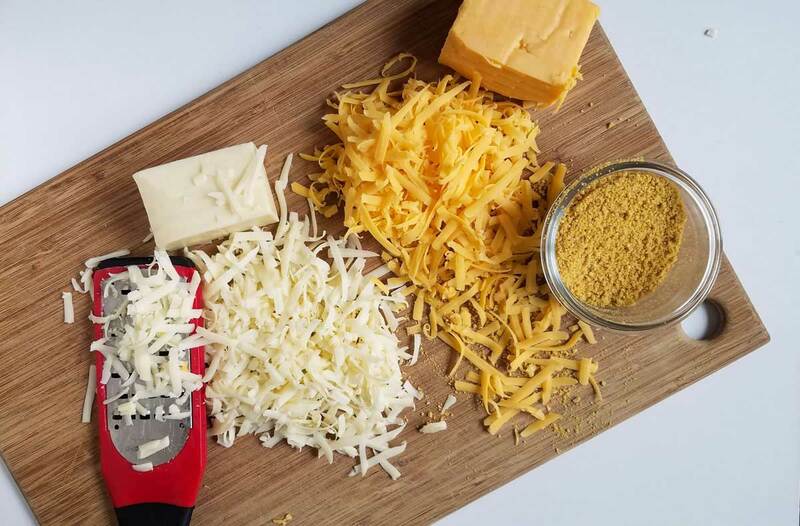 We suggest a blend in the recipe below, but if you really want to take it to the next level, have fun buying gourmet cheeses like Grayson, and Red Leicester; Yard Bird in Miami uses these, and their mac n' cheese is to die for (as rated by the Food & Wine magazine, and talking from personal experience). TIP: Substitute cheese with nutritional yeast, and butter for ghee if vegan or lactose-intolerant. Nutritional yeast will also boost B-vitamins and ghee provides a delicious flavor (the caveat is that it is a saturated fat - limit the use of such). Once cheese is shredded, add your cheese mixture (minus a little you'll save for topping off your mac in the final step) into a medium sauce pan with the cream, nutritional yeast and remaining black pepper and garlic powder. TIP: If you're are looking to skip the cream, use soy milk. Coconut cream is also a good substitute, but it adds extra carbs, making this dish not 100% keto friendly. Bring heat up until cheese begins to melt, and make sure you are constantly stirring/whisking to prevent clumping or sticking. It helps if you bring up the heat slowly and stand next to the pot to keep an eye on it. Once fully melted, reduce heat to low and keep warm, stirring every once in a while until ready. If mixture is too thick, add extra milk or heavy cream. In a large bowl (you can use the same bowl you seasoned your cauliflower in at the beginning), mix roasted cauliflower, bacon and cheese sauce, making sure each piece is evenly coated. Then pour mixture into oven safe dish and top off with remaining cheese. Broil on high for a few minutes or until cheese begins to brown. Feel free to add chives or green onion bulbs for garnish. And enjoy! Want to Save Some Time? 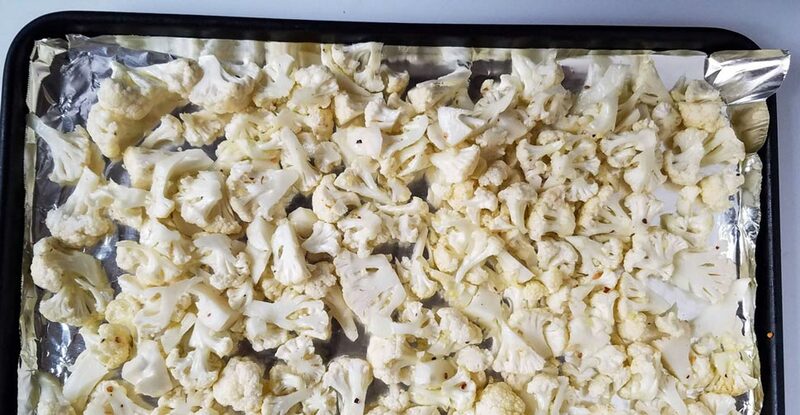 Get your cauliflower pre-cooked using our A La Carte veggies. Just season and roast on high heat for a few minutes to save yourself prep time and cooking time with this recipe! This is a perfect keto side for Thanksgiving. Aside from being a fast recipe, the secret here is the cheese sauce. We went ahead and made nutritional yeast part of the recipe, to up (and hide) the nutritional content, plus provide a slightly umami profile. Make sure your cauliflower is cut to tiny even florets - this will mimic the macaroni pasta. Preheat oven to 420° F.
Cut cauliflower to very small floret size. Drizzle with garlic powder, salt, 2 Tsp. pepper, and oil; toss gently to coat. Bake on a foil lined sheet tray for 12-15 minutes, until tender. Check constantly to avoid florets from burning. Remove once golden brown. Cut bacon strips half lengthwise, and then width-wise to small rectangular strips. Add bacon to a sauté pan, and bring the heat up from cold to medium. Don't stir for some time, until bacon begins to crisp up. Once the bacon begins looking like crispy small teeth, stir with a wooden utensil, and remove from heat once fully crispy. Keep aside on a plate lined with paper towels. In a medium sauce pan, combine cream, nutritional yeast, cheeses, and remaining 2 Tsp. black pepper and 2 Tsp. of garlic powder. Over medium heat, and constantly stirring, heat up mixture while cheese melts and incorporates. Once fully melted, reduce heat to low and keep warm, stirring every once in a while until ready. Switch oven to broil. Combine cauliflower, bacon and cheese mixture and pour into a baking dish. Add 1/4 cup of cheese on top and broil until cheese is golden brown and crispy on top. Serve warm. 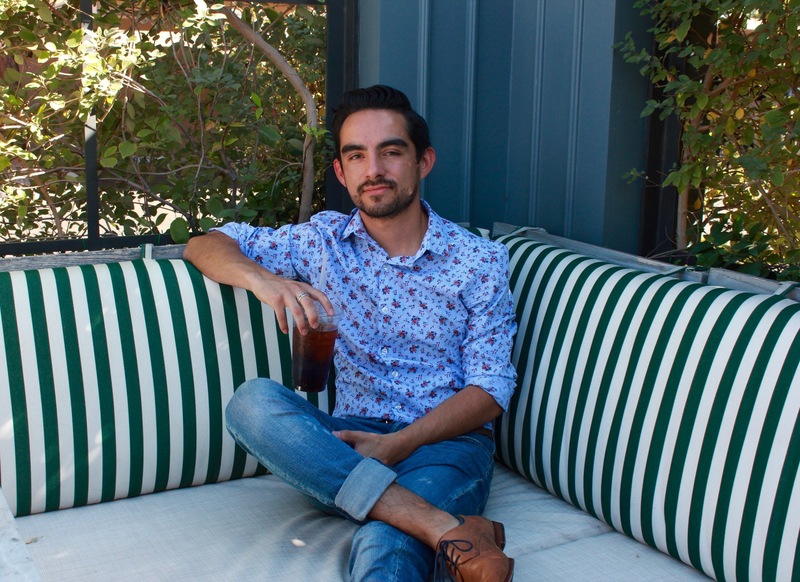 Tag or message our Executive Chef @mario_0323 with any questions you may have!